1973-05-10. Good. Ships with Tracking Number! INTERNATIONAL WORLDWIDE Shipping available. May not contain Access Codes or Supplements. May be ex-library. Shipping & Handling by region. Buy with confidence, excellent customer service! 0 First Edition/First Printing Published by Andre Deutsch, London 1973. Near Fine clean and tight condition. Dustjacket not price clipped and protected in archive cover. London: Andre Deutsch Ltd., 1973. Hardcover in good condition. First edition. Signed and dedicated by the author on the title page. Light scores and edgewear to the jacket; one or two minor nicks to the edges. Jacket and hardcover spine feet are bumped. Binding is sound; text and images are clear. Introduction by Lord Boyle of Handsworth. CM. Signed and Dedicated By Author. 1st Edition. Hardcover. Good. Used. London England: Andre Deutsch Ltd, 1973. Hardback. Iain Macleod. Slight foxing to edge. Blue cloth with silver lettering. Introduction by Lord Boyle of Handsworth. Contents: List of Illustrations. Acknowledgements. Introduction by Lord Boyle of Handsworth. Early Life. The War. The Conservative Research Department and the Enfiled Constituency. The House of Commons. Minister of Health. Minister of Labour and National Service. Secretary of State for the Colonies (I): East and Central Africa. Secretary of State for the Colonies (II): Africa. Secretary of State for the Colonies (III) the other Colonial Territories. Chanceloor of the Duchy of Lancaster (I): Leader of the House of Commons. Chancellor of the Duchy of Lancaster (II): Chariman of the Conservative Part Organisation. Chancellor of the Duchy of Lancaster (III): the Leadership Crisis in the Tory Party. Editor of the Spectator. In Opposition: Spokeman on Steel and Shadow Chancellor. Shadow Chancellor and Chancellor of the Exchequer. Iain Macleod - the Man and the Statesman. Appendix. Index. Illustrated. 352 pp. (We carry a wide selection of titles in The Arts, Theology, History, Politics, Social and Physical Sciences. academic and scholarly books and Modern First Editions, Reference books ,and all types of Academic Literature.). 3rd Impression. Cloth. Very Good/No Jacket. 8vo - over 7¾" - 9¾" Tall Octavo. Hardback. London England: Andre Deutsch, 1973. 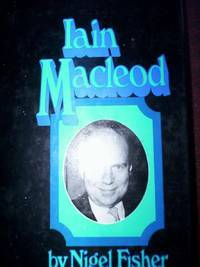 Iain MacLeod was one of the most interesting figures to achieve political prominence since the war. His complex character and outstanding gifts attracted many who would not normally have been sympathetic to Conservative policies. His career expresses perfectly the elusive concept of the 'radical Tory'. In this full, affectionate and illuminating biography, Nigel Fisher describes the circumstances and the qualities which made Iain MacLeod what he was. Nigel Fisher sheds valuable light on the apparent inconsistencies of MacLeod's personality. It is a moving and dramatic story about a man whose courage, compassion and idealism will appeal to readers of all political persuasions, as they did to those who knew him in his lifetime. Corners of boards very slightly bumped. Some wear and tear to D/J.. First Edition. Cloth. Very Good/Good. 8vo - over 7¾" - 9¾" tall. Hardback. Second impression. 352 pp. With 14 b/w illustrations. Introduction by Lord Boyle of Handsworth. A biography of the English Conservative politician Iain Macleod. Orange eps. Blue cloth boards with gilt lettering on spine. Narrow strip at top of spine and backboard lightly sunned. Overall condition VG+. In VG + illustrated dust wrapper. London: Andre Deutsch Limited, 1973. Hardback with dust jacket, 352 pages, illustrated. Binding sound, firm and clean, minor shelf wear. Packed well, prompt reliable dispatch. . Second Impression. Hard Cover. Good/Good. 8vo - over 7¾" - 9¾" Tall..
London: Andre Deutsch, 1973. First Edition. Hardcover. Very Good/near Very Good. First impression. 8vo. Pp 352 + 8pp b&w photographs. Blue cloth boards stamped in gilt on the spine. A clean, unmarked copy in a tight binding and unclipped dust jacket. The protected dust jacket is a little rubbed at the extremities and is chipped at the foot of the front fold. Previous owner's book plate on front pastedown endpaper. Andre Deutsch Ltd, 1973. 352pp. book in VGC slightly rubbed top and tail spine. Corners slightly bumped. Top edges faded. The dust cover is in VGc . Price clipped. Edges slightly rubbed.. First Edition. HardCover. Very Good/Very Good. 4to - over 9¾" - 12" tall. Andre Deutsch, 1973. First Edition. Hardback with Dust Wrapper. Very Good/Very Good. Name on front endpaper. Wrapper has edge wear. Macleod was one of the most able Tory politicians of his age. Illustrated with black and white photographs . ISBN: 0233963243. Deutsch, 1973. This book has hardback covers. Ex-library, With usual stamps and markings, In poor condition, suitable as a reading copy.